The train bound for Bergen offers a picturesque glimpse at Norway’s natural delights. Frozen lakes wedged between icy peaks; ragged pine-lined gorges plunging to black-ribbon creeks; leafless trees like skeletons starved by winter; and colourful toy-like houses spotted across endless walls of white. We departed Oslo Sentral (Oslo S) right on 8.11am, excited for the 12 hour adventure ahead. I had read many rave reviews about the train ride to Bergen and the Norway in a Nutshell package, which offers travellers a compact experience of rail-side scenery, the world-renowned western fjords and Norway’s second largest city, Bergen. Even though most journey reviews and promotional material emphasise its appeal during summer, all of my high expectations were exceeded by the harsh winter beauty. 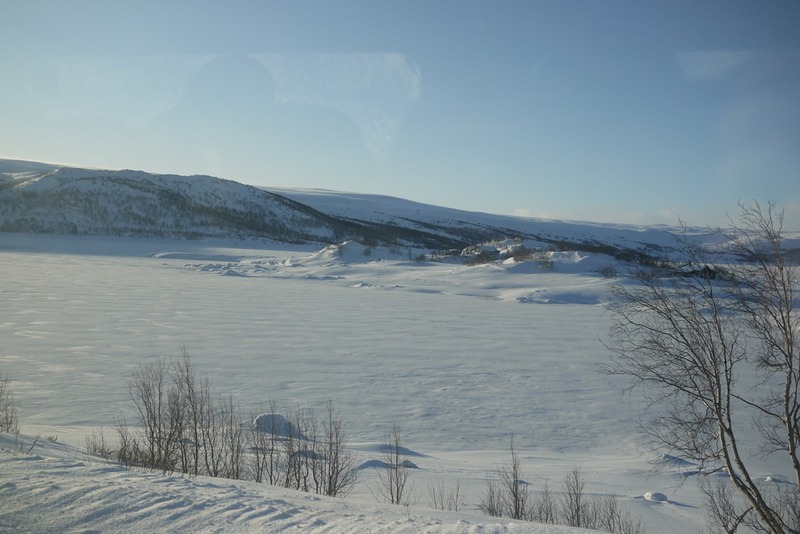 Climbing across the Hardangervidda plateau and into thick alpine wilderness, we enjoyed the first five hours of the journey on a very comfortable train (complete with power outlets, Wi-fi and a dinning carriage). By the time we arrived at Finse (1222m above sea level and close to the Hardangerjøkulen ice cap) the temperature outside had dropped to –6C, the tracks were hidden by snow and a howling winds had transformed the view to a thick white fog. 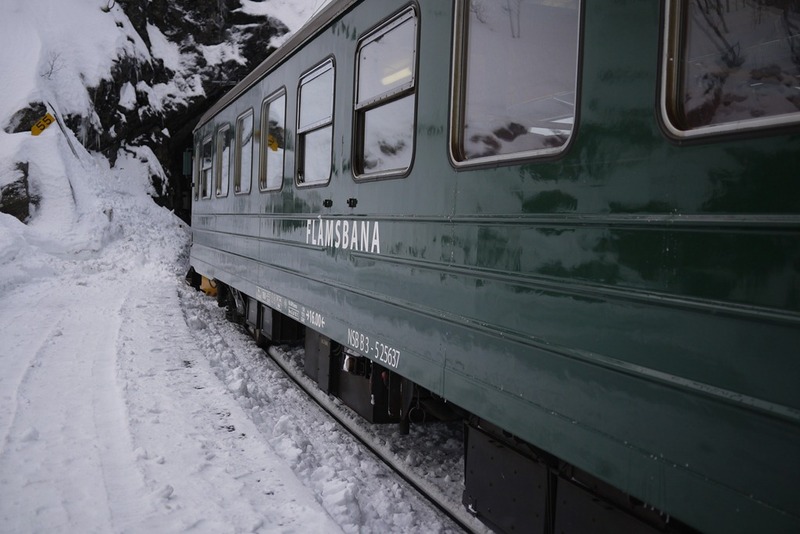 From there, we wound down to Myrdal (866m above sea level) and transferred to a waiting vintage train that would descend 850m along the famous Flåm Railway. The Flåm Railway is a bit of an engineering wonder, as I understand. Despite the sharp drop in altitude, the line is only 6km long, has 20 tunnels and has been around in one form or another since the early 1900s. The train also boasts five sets of brakes to handle what is apparently the steepest gradient railway in Europe used by a conventional train. However, I was most impressed by the grand views that the twisting railway revealed, which sent me bounding between windows, camera in hand. After about 20 minutes, we arrived at the small fjord-side town of Flåm for an hour ‘lunch break’ before our tour of the fjords. Although quite a pretty town, we only saw four locals (souvenir shop attendant, rail museum man, rail conductor and ferry operator) and three other tourists in Flåm, making the wintery port an eerie rest stop with very limited ‘lunch’ options. That said, the wide decks and ample outdoor seating hinted at a town rich in tourism during the summer. The large ferry to Gudvangen was equally quiet, with only the crew, our party of three and one other tourist aboard for the 2 hour tour. As we glided through the glassy fjords, steep rock walls glaring down from both sides, it seemed again as though we had found a place without time. 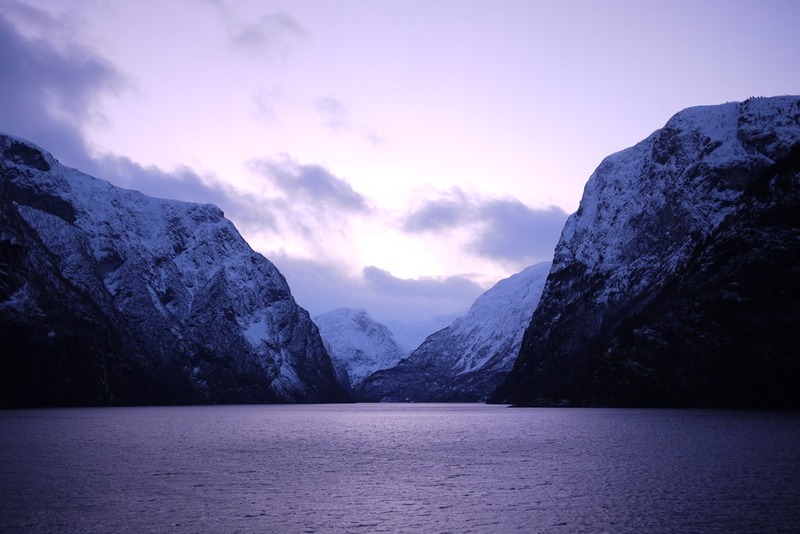 The pristine beauty of the fjords was something I could not have imagined and could not do justice with a camera. Even if the rest of the days journey had been miserable, it still would have been worth it to witness the majesty of the fjords. From Gudvangen we took an hour-long bus ride to Voss, and then an hour train trip to Bergen, where we were greeted with stinging sleet. 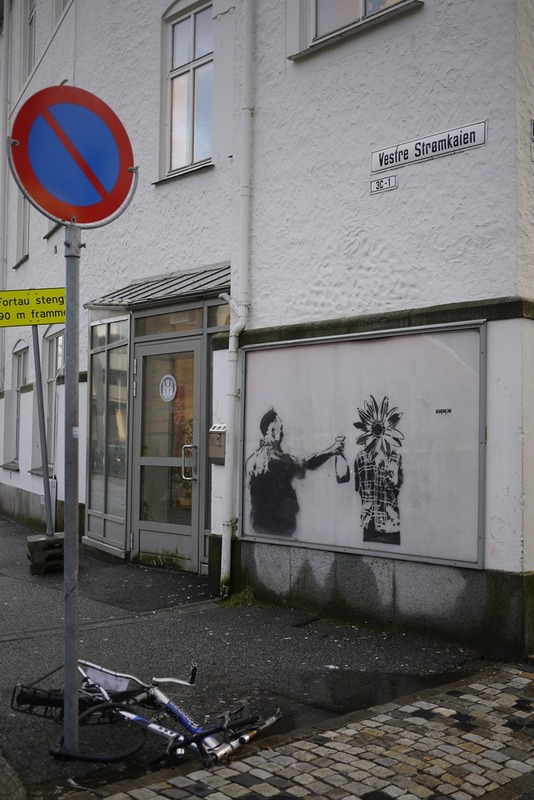 By morning, Bergen was a more welcoming place. 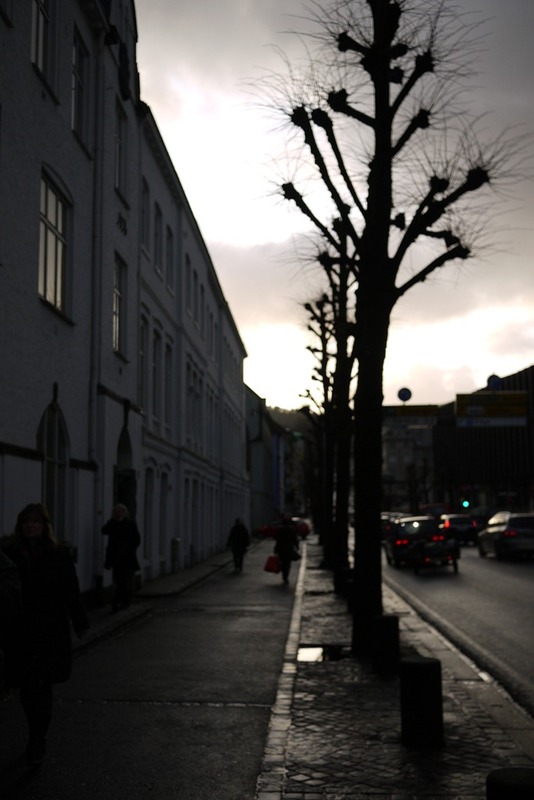 With an an average of 21 rainy days in January and only about 18 hours of sunlight throughout the month, Bergen was gracious enough to give us about a couple of hours of patchy sunlight (as well as sleet, pouring rain and whipping wind). Known as a Norway’s western city of rain, fish and culture, Bergen is a eclectic contrast to Oslo. A walk through the old quarter, Bryggen, offered crooked wooden houses, cobbled streets slick with the recent rain and narrow lanes lined with cosy designer shops. Then there was the salty drift of the fish market, cruise ships and sea-gull skies along Bergen’s port. 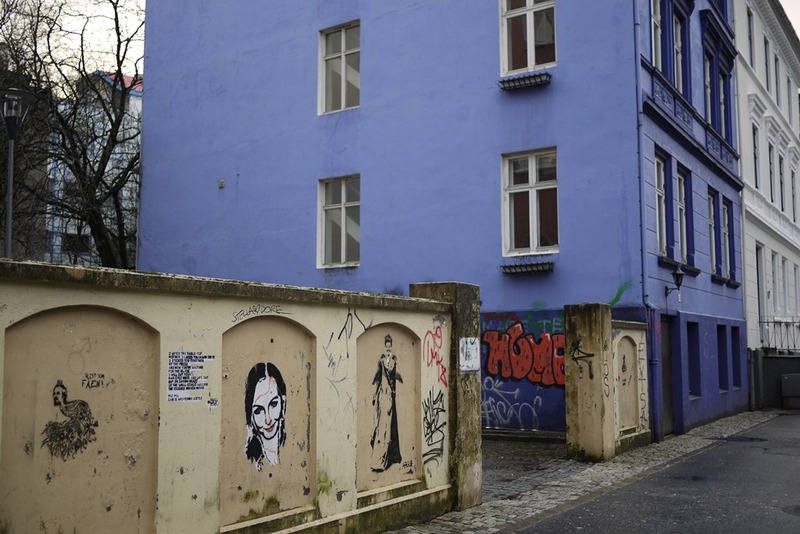 Further up the hill, towards the university, we found the artistic edge of Bergen: graffitied stone walls, poster-painted street lamps, dismantled bicycles and funky hole-in-the-wall bars. 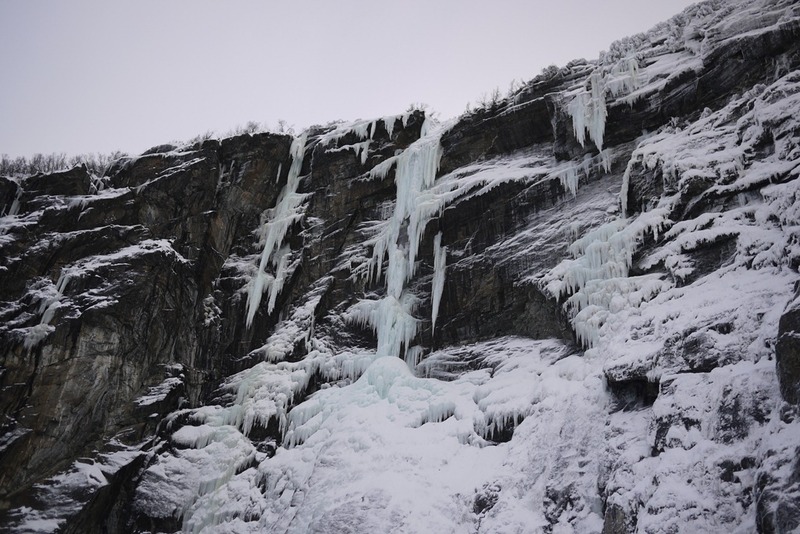 By the end of our three day Oslo-Bergen-Oslo trip, I felt well briefed about the wonders of Western Norway in winter. 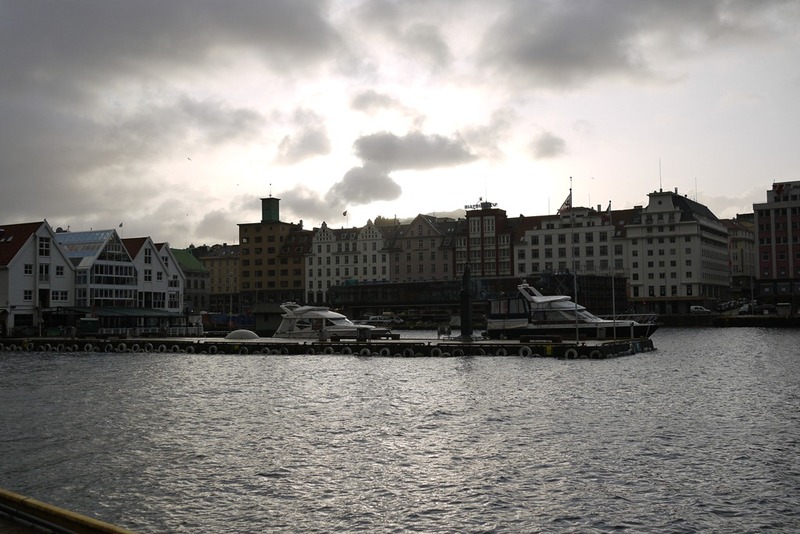 Of course, there is plenty more to do in Bergen with a bit of money and time– e.g. museums, the cable car, the aquarium, and ferry trips, walks and cycling when the weather warms. I will say that Bergen seems a town much more suitable to summer tourism. I also suspect Bergen would appeal even more to the culture-lover if accompanied with some local insight and summer crowds. Booking ‘Norway in a Nutshell’: Check out the Norway in a Nutshell website for more information and to book. You can book online if it is more than 7 days before your journey, otherwise head down to a tourist office or Oslo Sentral, where you can buy the package from the NBS ticket desks. One way price is 1430 NOK (about AUS$230). Booking trains to and from Bergen: If you’re just after a train ticket without the package, you can buy tickets online or at the station. It’s worth having a looking on the NSB website as soon before your journey as possible to secure yourself a minipris ticket. The rail company allocates brackets of discounted tickets for long train journeys (199NOK, 299NOk etc.) and offers them using a first in, best dressed system. 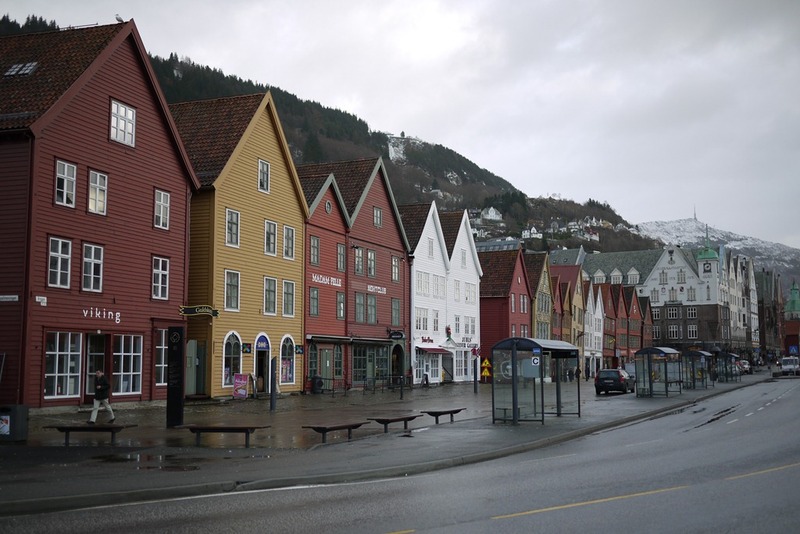 Accommodation in Bergen: Bergen is known for its accommodation but, like the rest of Norway, it’s quite pricey by Australian standards and offers more boutique and ‘comfort’ accommodation than budget lodgings. 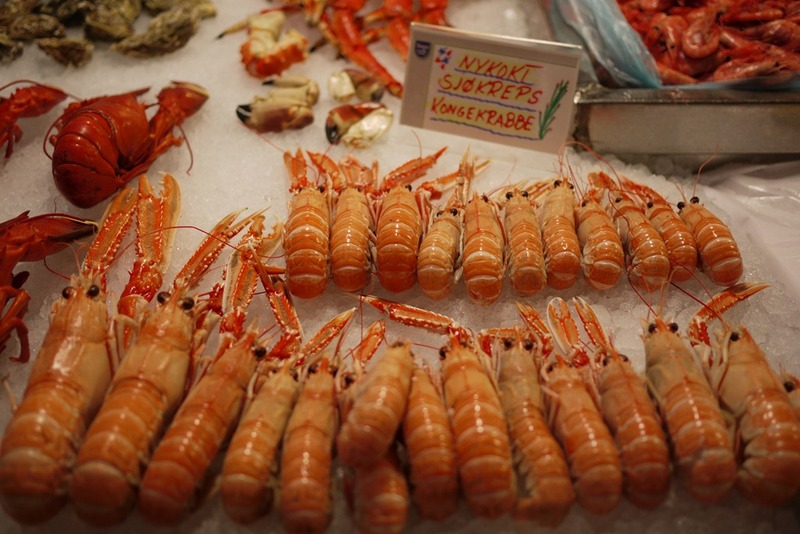 If you feel like splashing out, Bergen is a good place to do it. Otherwise, you can try places like the YMCA for a 250NOK (just under AUS$50) dorm bunk. Make sure you have something booked before you arrive. Yay fjords! I think I can afford to accord you the title of lords of the fjords. Great photos you two! If I had any kind of money and wasn’t starting a new job tomorrow, I’d be on a plane over there right about now. Hey Josh! I am quite pleased to be a lord of the fjord.. thank you for bestowing such a regal title! Good luck with the new job! I’m sure it will be wonderfully entertaining and good for the monies. Save and come visit us! Until then, I’ll keep sharing stories. 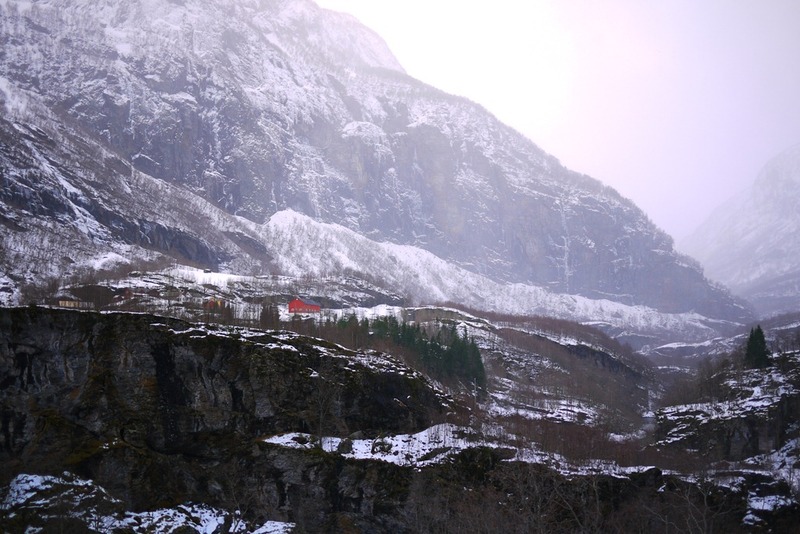 The Flåm Railway (Flåmsbana) loops its way from Myrdal to Flåm 865 meters below. The train journey provides some of Norway’s wildest and most magnificent scenery. Really interesting post. I’ve not been to the Fjords in the winter(my bike doesn’t like the cold). Hey Stevie, thanks for reading. Glad you found the post interesting. 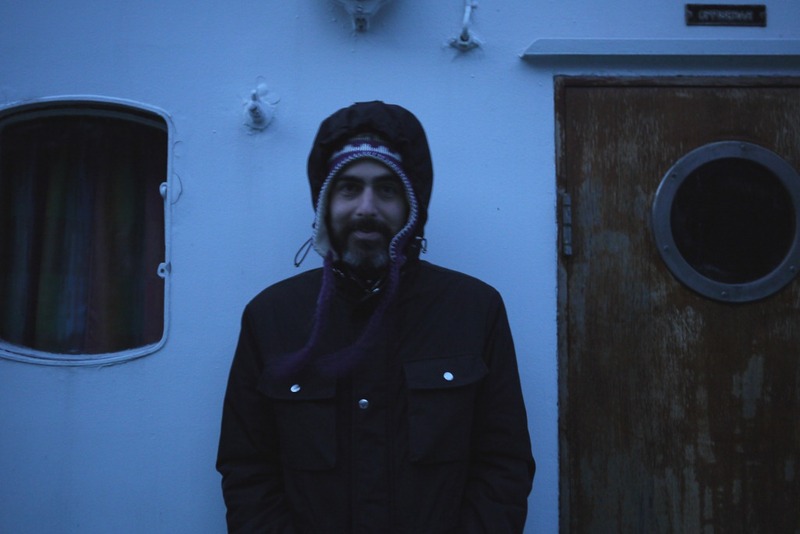 I think your bike is a bit clever – it was hard to stand outside on the ferry for too long in that cold. While the fjords were spectacular in winter, with the snow-capped peaks around them, I definitely want to go back in summer and do the biking/hiking fjord experience. Can I recommend early summer, say May time. Temperature not bad but still lots of snow lying – the best of both worlds. Thanks Stevie. I like the sound of that.